Kelly Flynn has been enjoying motherhood and avoiding murder, but when a friend's life is cut short, she enlists the Lambspun knitters to catch a heartless killer in the last Knitting Mystery novel from the New York Times bestselling author of Only Skein Deep. Kelly is happily busy with her son, Jack, now a rambunctious four-year-old preschooler. Jack keeps his mom on her toes and drinking all the coffee she can handle at Pete's Porch Café. Kelly's friendly waitress Julie is hoping to become an accountant. She makes sure she keeps Kelly caffeinated and up-to-date on her career progress. Kelly splits her free time between Pete's and Lambspun, where her fellow knitters love hearing all about Jack's latest exploits. They've also been taking a trip down memory lane, reminiscing about crimes that Kelly had a hand in solving over the years. But the Lambspun crew is horrified when a very present-day murder occurs in their midst--and Julie is the victim. 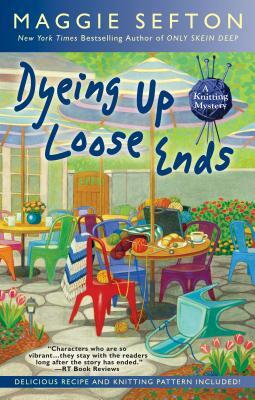 Maggie Sefton is the author of the New York Times bestselling Knitting Mysteries, including Only Skein Deep, Knit to Be Tied, Purl Up and Die, and Yarn Over Murder. She has worked in several careers over the years, from a CPA to a real estate broker in the Rocky Mountain West.